Arsenal’s 11 match winning streak in all competitions can to an end over the weekend as they were held to a 2-2 draw away to Crystal Palace. Chelsea and Liverpool continued with their unbeaten start to the league campaign thanks to 3-0 and 4-1 victories over Burnely and Cardiff City respectively. At Old Trafford, Manchester United powered their way onto a fifth league win of the season as Jose Mourinho’s side defeated Everton 2-1. Elsewhere, only Brighton in the bottom half managed a league victory on match-day 10 thanks to a 1-0 defeat of Wolves while Watford and Bournemouth also helped themselves to three points over Huddersfield and Fulham respectively. Here are the 11 players that stood out for me in game week nine. GK. Lukas Fabianski (West Ham United). Playing for over 50 minutes with 10 men, West Ham was always going to be on the back foot against a more than potent in attack Leicester City side on Saturday evening. They had to rely on shot-stopper Lukas Fabianski if they were to get anything out of the game and boy, how the Polish international helped their cause. Fabianski made seven saves as his side grinned out a point at the King Power, more than enough to convince me to slot him in between the sticks in my team of the week. RB. Bruno Saltor (Brighton and Hove Albion). The Bright and Hove Albion Captain became the oldest player since Jussi Jaaskelainen in 2014 to provide an assist in the league as his side defeated in form Wolves 1-0 on Saturday. Aside from the assist to Glenn Murrey for the winner, the 38 year old was magnificent at right-back as his Brighton side helped themselves to a third consecutive victory and clean sheet of the season. Yes the ball deflected off his back for Leicester’s equalizer but Balbuena who has instantly hit the ground running in the Premier League stood out of the fold at the King Power on Saturday. Solid and composed at the back all day and also managed to score his first goal in a Hammer’s shirt to put his side 1-0 up in the first half. He made 15 clearances against Leicester City, the most by any player over the weekend. After a frustrating season last, Luiz is playing arguably the best football of his career under new manager Maurizio Sarri this season. He was solid all day against Burnely as he stood firm and layed the foundation for his sides’s 4-0 victory. his partnership with Antonio Rudigar promises to take Chelsea places this season. Xhaka conceded the second penalty that resulted into Palace’s second goal but his perfomance at left-back was ok provided that he is a Central-Midfielder inside-out . Scored arguebly the best goal of the weekend via a stunning free-kick and also delivered the corner from which Arsenal scored their second in the 2-2 draw at Selhurst Park. MF. Luka Milivojevic (Crystal Palace). The Palace Captain converted two penalties as his side fought to a 2-2 draw at home to Arsenal on Sunday. Palace has been struggling to score goals lately and coupled by Milivojevic’s penalty miss last week, that all tells you how vital the Australian’s two were for him and his side. A goal and two assists for the Englishman as his Chelsea side brushed-aside Burnely 4-0 this past weekend. 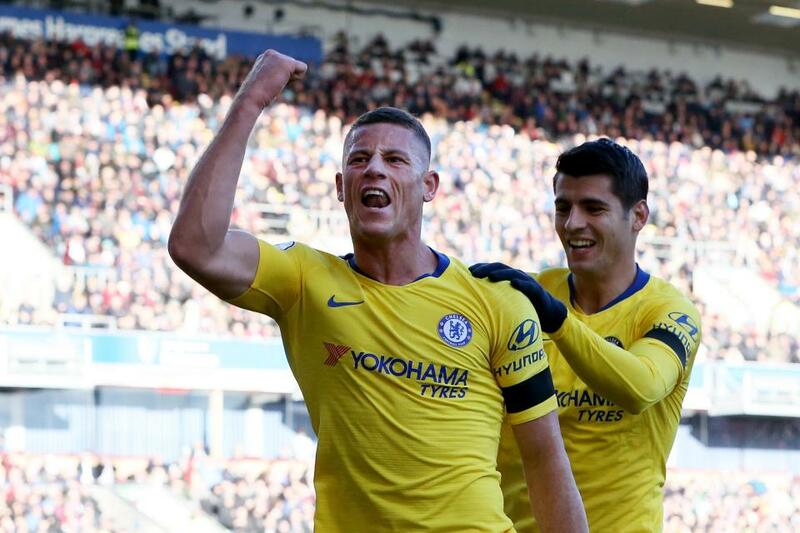 On a day that the Blues were missing their star player-Edin Hazard, it was Berkley who took over and ran the show proper, ensuring that Chelsea stay just two points off top spot. Pereira scored a wonderful goal as Watford defeated huddersfield Town 3-0 on Saturday. His solo run baffling half the Huddersfield team, and a creative inspiration for the in-form Hornets. FW. Anthony Martial (Manchester United). Tormented Everton, winning a penalty, scoring a stunning curling goal and playing as well as he has at any point in his United career. Martial now looks like the player he promised to become when he made the lucrative move from Monaco four years ago. Scored one goal and helped set up two more in the 4-1 defeat of Cardiff. As the Reds prepare for a mouth-watering fixture away to Arsenal next weekend, is it proper to say that Liverpool’s Egyptian king is back in form? A well-taken brace against Fulham showed his considerable threat and took his tally to six league goals for the season.